Glass tile. Shaker cabinets. Marble countertops. A walk-in shower. The choices are options are seemingly endless. After taking into consideration many factors – space, comfort, plumbing, personal style – a fundamental part of any bathroom remodeling project is choosing the right layout. Single wet wall. All plumbing is confined to a single wet wall, where the sink, toilet and bath area are in the same line. This is a common design and is ideal when you’re working within a restricted budget or space. The only drawback is it limits your design choices. Extra storage. If you are striving for additional storage space in your bathroom, then choose a design where two sinks open from adjacent storage areas. Additionally, create a linen closet in such a way that it conceals the toilet, so it’s not in the direct line of view from the vanity. No-tub bathroom. 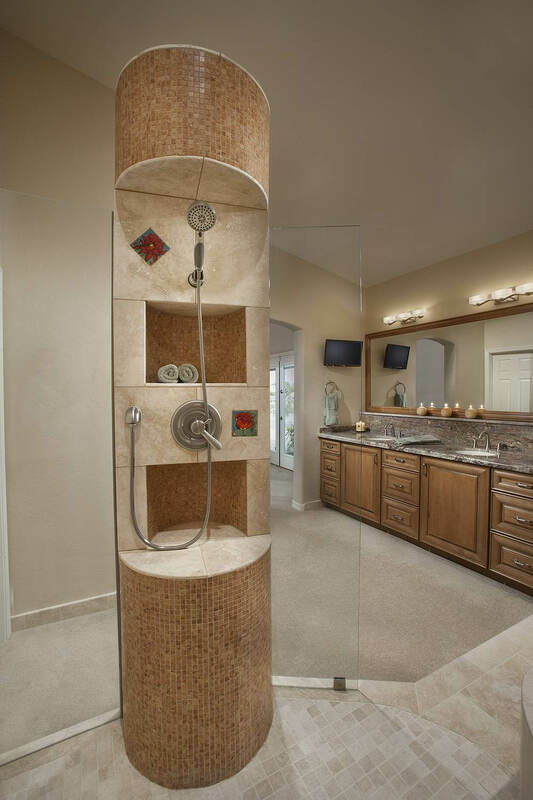 If you prefer a walk-in shower, it can give you greater flexibility in design. Why? You can choose to have a bigger shower area, two sinks, an extra linen closet or perhaps a larger vanity, depending on what you decide. A variation could even be the addition of a tempered glass door between the vanity and the shower. An important factor to consider for any bathroom remodeling project is privacy. If your bathroom is large enough, its always a good idea to design a separate toilet compartment to avoid placing the toilet in the direct line-of-sight from your vanity. Even in the case of smaller-sized bathrooms, you can move the toilet to the side. While creating a partition between your vanity and toilet, always work to avoid solid walls as this can make some people feel claustrophobic. Opt for walls made of tempered glass that can obscure views without blocking all of the light. If you prefer to soak in a tub and relax at the end of the day, then choose a tub that best matches the size of your bathroom. Today, tubs come in all shapes and sizes, so keep in mind the size and your personal style while selecting the right one. Conversely, if you’re not a big fan of tubs, consider a luxurious walk-in shower instead. An important, practical consideration when planning a bathroom renovation is the existing plumbing setup. Remodeling costs can quickly climb if you want to change your existing plumbing lines. So, depending on your budget, you can either change these lines or swap sinks, toilets and showers to connect with the current plumbing lines. Next to kitchens, bathrooms are often next in importance and value in your Phoenix or Scottsdale home. That’s because you spend lots of time there, so it’s important for your bathroom to be a room that is welcoming and relaxing. In addition, your home’s bathrooms are often remembered by visitors – and future buyers – as a testament of your home’s quality. Republic West Remodeling can help you fine tune the many details that will make your bathroom great. We offer the best Phoenix & Scottsdale bathroom remodeling services in the area. Contact us today to schedule your free consultation.